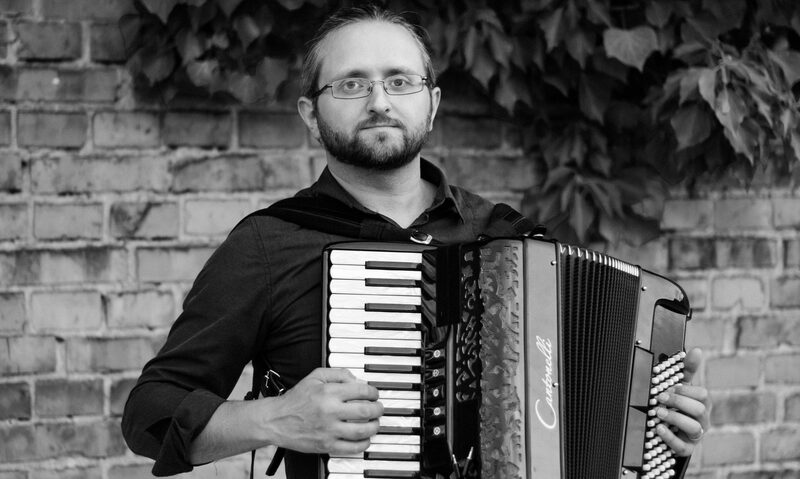 Latvian-born accordionist Ilya Shneyveys played lavishly and even epically throughout a set of original and often relatively obscure klezmer songs from across the Jewish diaspora. He opened his set by explaining that he was going much further afield, beyond horas and Hava Nagila, and he wasn’t kidding. With long, lingering, suspenseful intros building to waterfalling and then absolutely torrential volleys of notes, he used every second of the allotted time to air out every bracing chromatic and adrenalizing minor key in a series of dances and more subdued material. The highlight was a slowly crescendoing, rather mysterious diptych typically played as an introductory theme for wedding guests. “Cocktail music,” he smirked. Würde man Ilya Shneyveys auf der Straße begegnen, fiele einem vielleicht auf, dass er recht groß ist und einen Pferdeschwanz trägt. Ansonsten wäre er einer von vielen. Die rund 400 Gäste in der Halle sechs des Zughafens trafen ihn jedochnicht auf der Straße sondern auf der Bühne – und er sie tief in der Seele. Was er als Dirigent mit den 30 Jugendlichen aus Haifa und Weimar rund 120 Minuten zauberte, brachte das Publikum in beste Stimmung. Ilya Shneyveys, a musician and Yiddish music teacher, made sure everyone was on the dance floor moving to the melodies of the Tsu Fil Duvids Klezmer Ensemble.